Rondam Ramblings: How Donald Trump Could Build an Autocracy in the U.S. I like the cartoon and don't really have specific cause to doubt it, but do you know its original source? Or can you say where you got it? I'd like to share it around. I fell for that Trump meme where he was supposedly quoted sayinig he'd run for president as a republican because they are stupid. 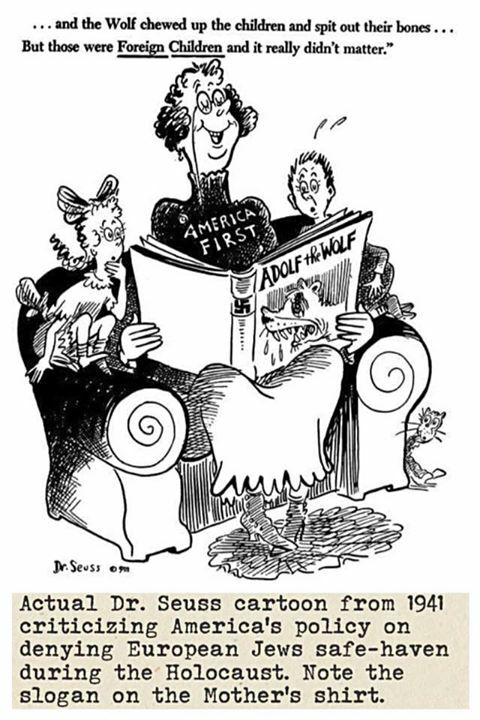 Never mind, seems to be legit: http://www.snopes.com/dr-seuss-adolf-wolf/ plus other easily googled sources. When I attended the The New Politics of Church/​State Relations conference at Stanford, I asked one of the Stanford law profs whether he thought students believed too much in law. He said no, it's actually the faculty who believe too much in law. I suspect that expert testimony should be treated as a bit more than merely anecdotal. From here, we can move to how character is formed—or not formed. Just what does it take for those who choose to run for elected office to have the requisite "competence and integrity" to rule well? It is important to understand the institutional dependence of character, captured in works such as John M. Doris' Lack of Character: Personality and Moral Behavior. The aforementioned sociologist is very insistent that character is much more social than individual; I think the Bible would concur on this matter as well. However, this means that bad character in Presidential candidates reflects that much more badly on more of society. We... have some repenting to do. Unless we want more of this. I predict scapegoating—insisting that "my" side is righteous and the "Other" is evil—will lead only to bad places. "... / If you take away the yoke from your midst, / the pointing of the finger, and speaking wickedness, / ..."